It’s a scary statistic: The Animal Cancer Foundation (ACF) reports that 1 in 4 dogs and 1 in 5 cats will develop cancer. In fact, it’s the leading cause of death for dogs over the age of two. Just as with people, the longer your pet lives, the higher their risk of developing some form of the disease. The most common types of cancer in dogs include lymphoma, mast cell tumors in skin, and osteosarcoma (bone cancer). 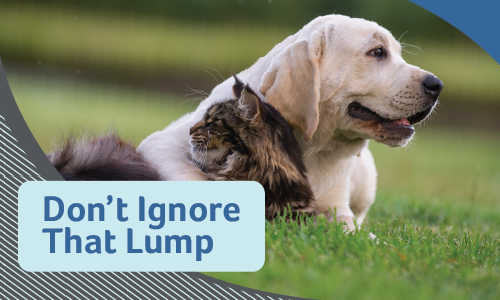 Some of these cancers have subtle symptoms or may appear as an enlargement or lump that a pet owner might just attribute to aging. That’s why it’s important that pets have annual wellness checks—and for pets over seven, GAH recommends twice-yearly exams and blood testing as well as chest and abdominal X-rays. It’s especially crucial for cats, who are experts at hiding illness but often have more aggressive cancers than dogs. Many types of pet cancers are treatable, but the earlier they’re caught, the better your pet’s chances of a good outcome. For more information on pet cancer or to schedule an exam for your pet, make an appointment online or call us at (630) 297-4709.